A 12-year-old Londonderry boy has saved Christmas for one man planning to pop the question over the festive season. 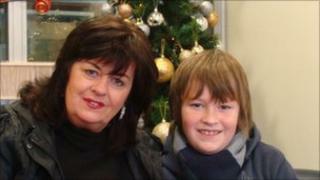 Oisin Taylor-Feeney and his mum Maggie were in the centre of Derry on Saturday when he spotted something in the snow. "We were walking along when I saw a bag from a jewellers. "I opened it up and there were men's gloves inside, and underneath them was a smaller bag with a box in it. "It looked like a box for a ring so I gave to my Mum. "There was a ring in it with a diamond in the middle, and lots of other smaller diamonds around it." "I knew straight away it was an engagement ring," said Maggie. "With the gloves in there, I immediately thought it must belong to some poor man who's bought the ring for his girlfriend." But the ring was in safe hands. Oisin immediately made it his mission to have the ring returned to its rightful owner. "We went in and left our details in the shops nearby, and then we went to the jewellers and returned the ring and left our details there as well. "I knew from the receipt that the man had taken out an extended warranty, so we thought the jewellers would know how to find him. "After that we were walking up Carlisle Road when the phone rang. "He must have said thank you about ten times, he was so happy. "He said the bag's not going to come off his wrist until the ring gets on his girlfriend's finger. "But he's going to propose on Christmas Eve, so we have to keep his identity completely secret until then. "I just hope she says yes."